TAG Heuer's Carrera series has epitomized racing style since its introduction nearly 50 years ago. This watch features a Calibre 5 automatic movement with an expanded date window at three o'clock. 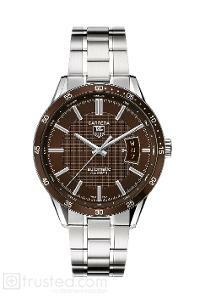 The brown dial features a Clous de Paris textured design with a matching brown aluminum bezel. The 39mm steel case is mated to a steel bracelet with alternating fine-brushed and polished steel elements.